The latest IDW crossover title: Star Trek vs. Tranformers got the attention of fans of both franchises with a fun and entertaining story full of surprises. “It was an amazing opportunity to get the chance to design the ICONIC! Enterprise as a Transformer , if you want to see how Fortress Tiberius comes to be check out Star trek vs Transformers #3”. You can check out the sketch after the jump. 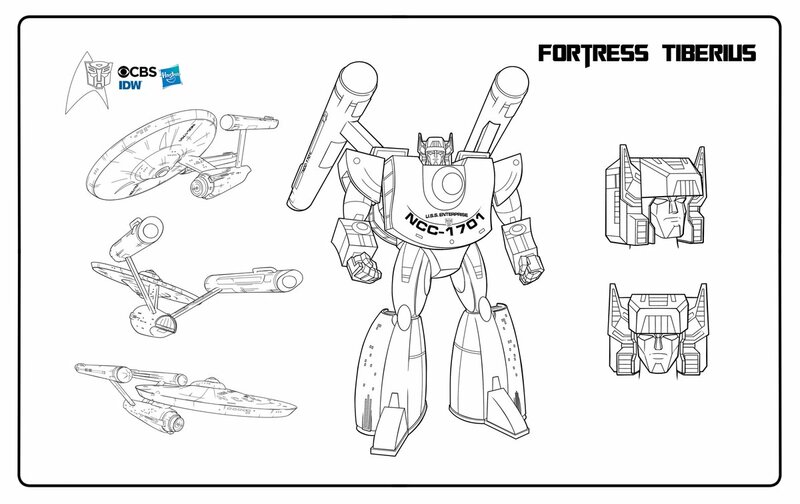 We are sure some of you are already asking for a figure of Fortress Tiberius to be released. Let us know your impressions on the 2005 Boards! 3rd party – unlikely, but a lot more possible. That is cool and done right. What I didn't like about Star Wars transformers was the Death Star turned into Darth Vader. What?!?! That's not Star Wars Transformers, that's Star Wars with transforming ships. It should've been Unicron as the Death Star. Starscream Tie Fighter, etc…. This works with the Transformers theme. Although this should've been Metroplex or Omega Supreme so Fort Max could be the Enterprise-D haha. a lot of comments on how cheaty it is, but like… 90% of non-toy-original designs have been just as cheaty and nobody's batted an eye.